Position a rack in the center of the oven and preheat the oven to 350 degrees. Have ready an ungreased 9-by-13-inch baking pan. Bring a few inches of water to a gentle simmer in a saucepan. Combine the bittersweet chocolate and butter in a heatproof bowl and place over (but not touching) the simmering water (or use a double boiler). Heat slowly, stirring occasionally, until nearly melted, and then remove the bowl from the heat and whisk until smooth. Add the granulated and brown sugars and stir until blended. Add the eggs all at once and stir to combine. In a bowl, sift together the flour and baking powder. Using a whisk or rubber spatula, gently whisk or fold the flour mixture into the chocolate mixture just until combined. 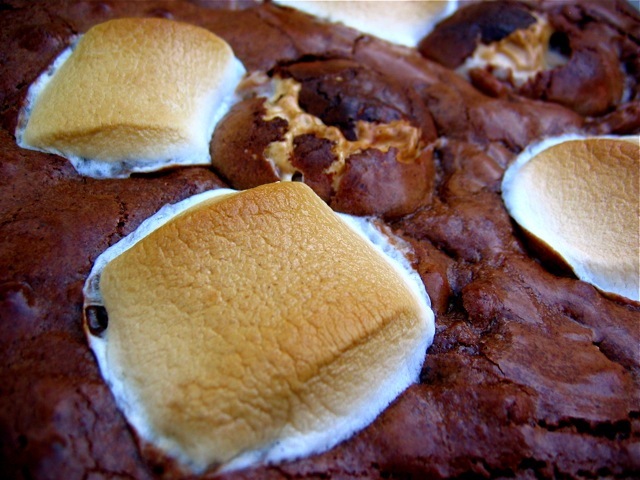 Fold in the milk chocolate, graham crackers, and half of the marshmallows. Pour the batter into the prepared pan. Dot the surface of the batter evenly with the remaining marshmallows. Bake for about 30 minutes, or until slightly souffléd but still wet in the center. The marshmallows will puff up and be a light golden brown and the chocolate surface will crack a little. Let cool in the pan on a cooling rack for about 45 minutes, or until completely cool. Cut into squares, as big or small as you like. They will keep well for up to 2 days stored at room temperature in an airtight container or tightly wrapped in plastic. Culinate editor's notes: Elizabeth Falkner makes her own graham crackers and marshmallows for this recipe, but you can easily substitute store-bought ingredients. You may also wish to bake the brownies for longer, to ensure that they're fully cooked.